A must have for your wood fired oven. This is one our most popular products. It allows you to get maximum use out of your oven. Great for grilling meats at high temperatures for authentic “Steak House” results. The Tuscan grill is another of Wildwoods signature accessories for the wood fired oven. Lite enough to slide in and out of the oven with ease due to the sled style designed grill support, which will not damage your hearth. This rack has an easy to grasp handle and is made from heavy 1/4 inch solid stainless steel round bar. 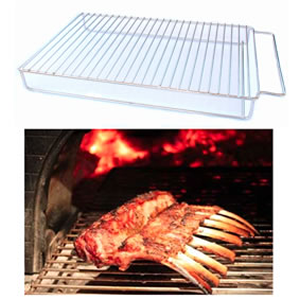 Electro polished to food grade standards, this versatile grill can also be used in your fireplace or over a campfire. This is the essential tool for grilling and roasting. Achieve steakhouse quality results right in your wood fired oven! Also great for grilling vegetables.